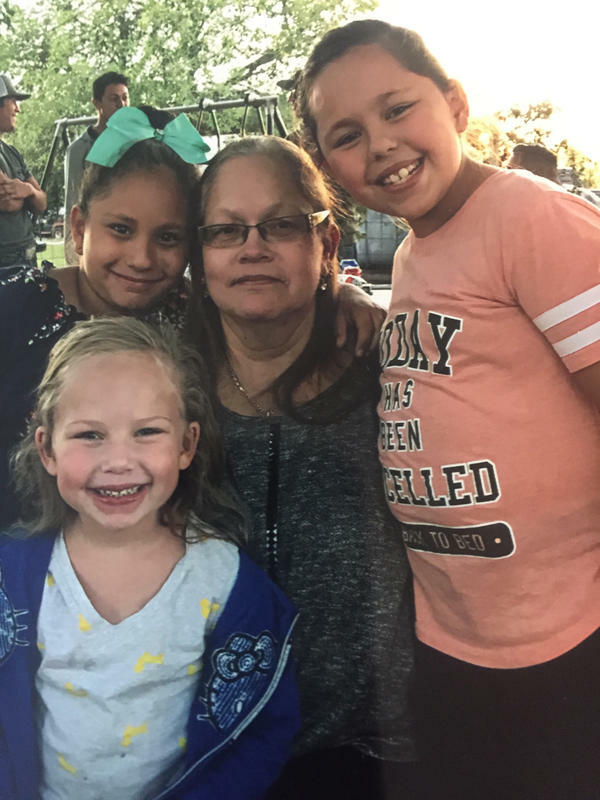 Brooke Ward, left front, Emily Garcia, left back, and Rhianna Garcia, right, with their grandmother Dalia Lookingbill. Joann Ward, right, with her husband Chris Ward. 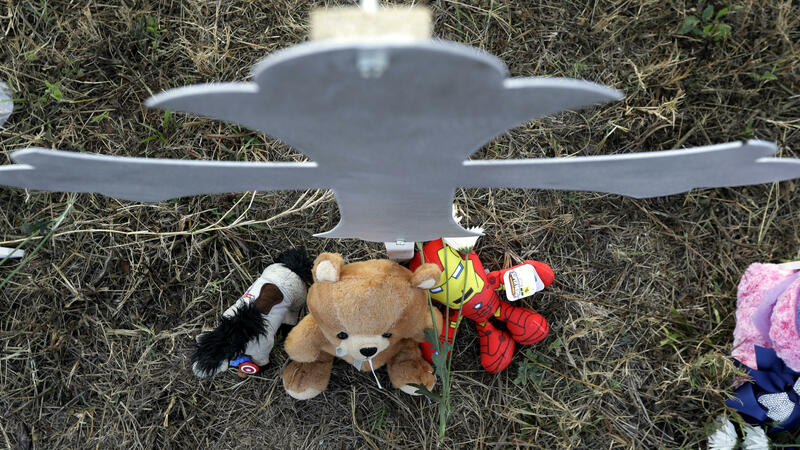 Stuffed animals sit at the base of a cross at a makeshift memorial for victims in Sutherland Springs, Texas. Now her surviving family, including Joann's 9-year-old daughter Rhianna, are one of many in the small town who are grieving multiple family members killed or injured in the attack. Emily and Brooke were two of the eight children who died. The full list of victims is here. Bob Lookingbill introduces himself as "Joann Ward's daddy." He's wrapped in a blanket at a cancer center in San Antonio, receiving his chemotherapy IV drip. His wife Dalia Lookingbill is by his side holding snapshots of Joann and the grandchildren, barely able to speak for her grief. "Joann was our baby," she says softly. Joann was the youngest of the Lookingbill's 9 kids. She was 30, and married to Chris Ward. Together they were raising their blended family of four children, 30 chickens, two dogs and a cat. "I tell you she calls every morning to check on her daddy," says Mrs. Lookingbill. "She's a beautiful daughter." They talked by phone every day — sometimes conference calls with siblings looped in. Her mother says Joann was always the clown in the family. "I don't care how sad you were that baby would make you laugh," she says. "By the time she was done talking to you, you'd be happy." Her dad says she didn't know a stranger, that everybody was a friend. "She just had a big heart," he says. When the gunman stormed First Baptist, Joann Ward's first instinct was to protect her kids. She pushed them to the floor and covered them with her body. "She lived for her children, and she died for 'em," says Mr. Lookingbill. Mr. Lookingbill says the oldest daughter Rihanna who escaped the church alive, has told the family how her mother pushed her down and "scooped up three of the babies and was laying on them when the shooter kept shooting through her to get all the babies." That was the kind of mama she was, he says. She met the school bus every afternoon. Her kids came first. Two of them will be buried with her next week – 5-year-old Brooke Ward and 7-year-old Emily Garcia. Five-year-old Ryland "won't get out of the hospital for a while," Mr. Lookingbill says. "He was under Joann. He got shot somewhere between 3 and 5 times." The doctors are encouraged by his spirit. "He's just like a little drill bit," says Mr. Lookingbill. "He's tough. He's a fighter." Sandy Ward, Joann's mother-in-law, describes five-year-old Ryland, who just started kindergarten and is now in the hospital, as "full of spit and vinegar ... always running around and into everything, couldn't sit still." "He's just a little boy," Ward says. Fighting for his life at age 5 — the same age as his half-sister Brooke who was killed. It was Ryland who gave her the nickname Brookie. "She was just a little firecracker," her grandfather says about Brooke. "Always smiling." She was a "ham" for the camera like her mother they say. "When they sing at church, she would get out in the aisle and do her ballet," Ward said about Brooke in a separate interview with Texas Public Radio, "Because she wanted to be a ballerina. ... She was pretty good for a five-year-old with no training," she says with a laugh. Her sister Emily was the singer in the family, and that's what she wanted to be when she grew up. Her idol was the pop star Selena, and would sing her songs as a toddler riding in the grocery cart. "I never saw that kid mad, throwing a fit. She was always laughing and joking." The oldest sister, Rihanna, is 9. 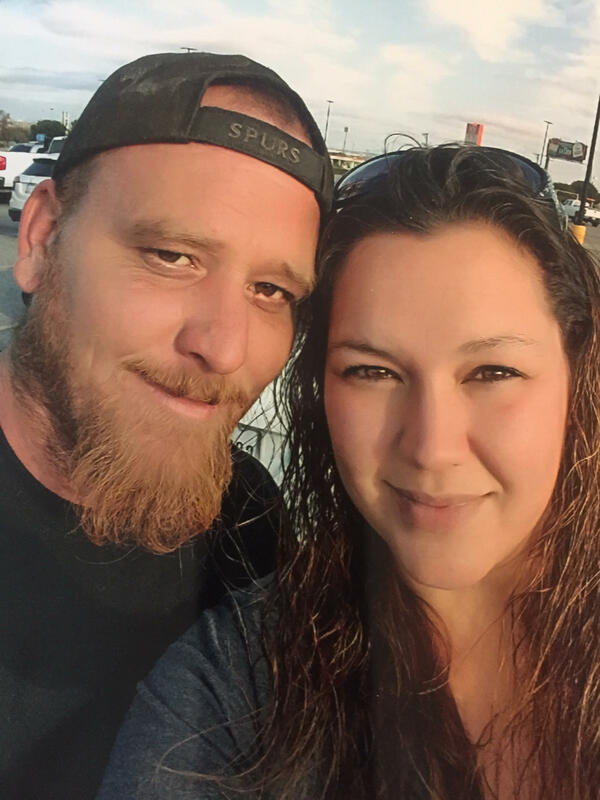 He says she wakes up every morning remembering a little bit more about the shooting. "She's gonna have a long, long recovery," he says. "She saw the bullets flying. She saw her brother's arm fly apart. She saw bodies stacked up." "And she saw her mother get shot," adds Dalia Lookingbill. "When they told her about her sister Emily, the first one we found out that didn't make it, she looked at me, she said, 'well at least Emily's in heaven now.'" Now, as the family prepares for a funeral for three next Wednesday, the family is struggling to make sense of the tragedy. "I put it squarely on the military's failure to identify this person and to prevent him from buying firearms," says Mr. Lookingbill, talking about the gunman, who had a record of domestic abuse in the Air Force. Sandy Ward says the thing that's hit her now is that her daughter-in-law's body wasn't identified until early Monday morning because she was so badly injured. She was finally identified through tattoos on her body. She was told that when Joann was found, she was holding 5-year-old Brooke. She says her son Chris, who lost his wife and two kids, told her he's not going back again to their house. "I can't say I blame him," she says, "because when I went to get the clothes yesterday, that's when it really hit me. Because you see Joann's clothes and Brooke's clothes and Emily's clothes. Just even their everyday clothes, and you realize, they're not going to need them anymore." Through tears, Sandy Ward says the family's deaths haven't hit her own 7-year-old daughter yet. She shares a birthday with 7-year-old Emily, who died. Sandy Ward and her family lived walking distance from her son and daughter-in-law and were "always over there." But now, "there's nobody there anymore. There's nobody there. She doesn't realize it." "I don't know what's going to happen when she wants to go there and go play."